Take a look at classic car auction results at these comprehensive sites! We're often asked about the best sources for auction results and prices, as well as places for sound pricing trends of classic cars. 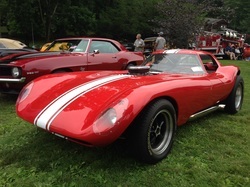 We like Hagerty, the auto insurer, which has separate collector car indices for Blue Chip cars, British automobiles, Ferraris, muscle cars, German collectibles, '50s American rides and affordable classics. Sports Car Market is another great source for pricing information, as is Hagerty, and Autoweek frequently publishes current auction figures.